A few years ago I attended a conference in Las Vegas on Multi-level Marketing. There were hundreds of people there looking to start their own party planning businesses, hoping to make it big and become the next Tupperware or Pampered Chef. Several people had CRAZY ideas - one was selling some purified water and others, vitamin supplements that probably didn’t work. The principle of a party business is you invite your friends over and they buy from you and then they register to become salespeople and host parties, and then the original host gets a percentage of the sales made down the line. What about a party business, though, where friends come over and instead of BUYING, they are actually SELLING and making money??? Now that’s a party I would like to attend! What a concept. This is exactly the idea January Thomas came up with earlier this year. Yes, in January 2008. 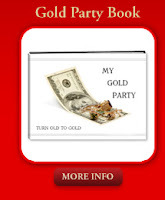 The business is called My Gold Party. The company sells kits on how to host your party, including a book, gold tester, scale, and magnification loupe. Thomas had been recently married. She had held on to several pieces of gold in her drawer for fifteen years and wanted to get rid of it. Instead of taking the gold to a pawn shop, she asked her brother in law, who is in the jewelry business, what the jewelry was worth and he gave her $200. She figured, if she had a couple hundred dollars worth of gold sitting in her drawer, imagine what a 40, 50, or 60 year old woman had in her drawer? Lots of other women must be in the same boat! Thomas, who had a background in sales, invested around $25,000 to get her business started, and within the first month she had already recouped her money. Her biggest concern with startup was whether or not there would be any interest in her idea. Apparently not. Her company was featured on March 17, 2008 on the NBC Nightly news, and there was significant interest immediately following. The most interesting party she has hosted so far included one person selling gold dentures, and the same night someone else had 12 carat gold press on nails to sell back. Guess you never know what you’ll find at a party. Thomas’s advice for anyone looking to start their own company is: "Go for it! It is such an incredible feeling - working for yourself!"